My Very First Blog: When Lightning Strikes! Did you know that Malaysia has one of the highest records of lightning strikes amongst the countries in the world? 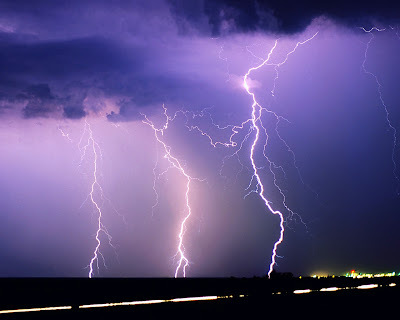 Being close to the Equator, we are prone to lightning and thunderstorms all year round. In fact, the Malaysian Meteorological Department recorded more than 300 days of lightning in a year in certain parts of the country! So what are the chances of anyone staying in Malaysia getting struck by lightning? I don't have the numbers with me, but I would say the chances are much higher than winning a lottery! I have seen many people jogging outside in the rain and even in thunderstorms. I have also seen many children playing football in the open field during lightning and thunderstorms. What were these people thinking? Aren't they aware of the dangers of lightning? 1. It is safe to use an umbrella in a lightning storm. 2. It is safer to take shelter under a tree rather than stay in the open during a lightning storm. 3. The car is one of the safest place to be in a thunderstorm. 4. If you see dark thunder clouds gathering over the horizon while in the open, you are at risk from being struck by lightning. 5. You are safe from being struck by lightning if you can hear the thunder but not see the lightning. 6. You only need to run for shelter when it rains as lightning occurs during the rain. 7. It is safe to use the mobile phone in a thunderstorm. 8. If you are caught in a thunderstorm outside, try to stay dry as the chances of getting struck by lightning is lower when you are dry. 9. Lying flat on the ground is the best position to take in the open field during a lightning storm. 10. It is safe to go out in the open once you are sure there is no more lightning and thunder. Well, how did you do? Scroll down for the answers. An umbrella is an easy target for lightning. Especially umbrellas with spiky tops. Lightning tends to strike tall objects, and trees are one of them. Therefore, never take shelter under a tree during lightning storm. It is probably better to stay out in the open away from trees and tall objects like poles and lamp posts. A car with a metal roof conducts electricity and brings it down to earth. Make sure not to touch any metal objects in the car and keep the windows rolled up. Of course, the safest place is still inside a concrete building. Lightning has been known to strike up to 10 miles from a storm, so even if the dark clouds are not above you at the moment, you are still in danger of being struck by lightning. Stop all acivities and seek shelter once you see dark clouds looming on the horizon. Lightning can strike up to 10 miles from a storm, so even if you don't notice the lightning, you may be within the lightning strike. Once you see the lightning, it may already be too late. Start looking for shelter when you hear the thunder. Lightning often occurs before the rain falls, so do not wait for the rain to fall before you act. As long as you are not out in the open, it is generally safe to use the mobile phone in a thunderstorm. Do not use land-line phones, any plugged-in electrical appliances, plumbing fixtures or anything that conducts electricity in a thunderstorm. As such, do not take a shower or touch any metallic object like door knobs and even taps in the house or building. Get yourself wet in a thunderstorm! Wet clothing helps to reduce serious injuries to the lightning struck person. Let the current flow over you instead of inside you. It is dangerous to touch the ground as all lightnings are grounded. Instead, the best position is to squat down with your feet together, your head tucked to your chest or between the knees, your hands covering your ears or flat on your knees. This will minimise injury as the lightning will flow over your body instead of through vital organs. Stay inside your shelter until about 30 minutes after the last thunder is heard. Lightning can still happen within that time frame. For more information on how to protect yourself from lightning, read wikihow. I have to admit I am kinda afraid of the loud crashing sound when the lightning strikes. That white line that flashes can be quite intimidating. Don't stand out in the open field when there are flashes of lightning. My grandma used to say not to turn on the tap at the kitchen sink (near any window) and stand there when there are flashes of lightning. She says lightning may strike the person. Anyone know if this is true? I just know that when lightning strikes, stay at home and hide under a blanket! i still didn't make it to be yer FC!!! i dunno when can i be FC here!!! *cry* for me!!! I only know the car part - it is the most safest place to be - cause I saw a documentary on it. that's informative.. and btw im one of those who jogs in the rain :p... wish me luck! Just like Gallivanter, I only know the car part too ... LOL! But I must show my kids this post cos those two just don't know how dangerous lightning is and are forever taking their time to come back from the park when there is thunder! One of my colleague lost his teenage son who got struck by a lightning while training for a football match. Scary. Great tips, Foong. Thanks. I especially like tip #7. A friend lost two tv sets being struck by lightning. I was told that if it happens once, it may happen again if the tv location is not changed. I believe death by lightning is predetermined but of course it doesn't mean that we don't have to take precautions. I heard that lightning striking a home (that is, when the roof gets blown off) normally means that the lightning is getting rid of spirits in the home. I guess that is a good thing. No? mei teng, I sometimes get a shock when there's a sudden thunder. But other than that, as long as I'm inside a building, I don't get too troubled by the loud sound of thunder. But if I'm outside, that's a different story! Haha! I think there's some truth in what your grandma said. If it's an open window, there's a chance the lightning may strike you. Better not stand too close to any windows! As for turning on the tap, it's a big No! Water and the tap conducts electricity. I would say just stay away from anything that conducts electricity during a thunderstorm. lisalicious, yes a lot of cases of people struck by lightning in Malaysia. It's very dangerous. I always advise people not to go out in the open during a thunderstorm. lina, yes it happened before and will happen again if people ignore the dangers of lightning. I'm quite surprised the Government did not warn the public about the dangers of lightning seeing that Malaysia has one of the highest records of lightning strikes in the world! happysurfer, wow! Lost 2 TV sets caused by lightning? Should have learnt lesson the first time. Haha! Have never heard of lightning blowing off the roof top is to get rid of spirits, but if that is true, then I guess it's a good thing. Haha! out of the topic.. i am actually thinking how we can generate energy and power from those lightning, since we have so much?? hmmm, that would be interesting.. Very true, that's why I still flinch whenever I see people using umbrellas in a thunderstorm - they don't realise the danger they're bringing to themselves and nearby passers-by. Well, I only like this kind of weather when I'm safely at home, not stuck in the middle of the highway. Wow, I never knew that. ahaha, we learn something new everyday, dont we? I didn't know that Malaysia has one of the highest records of lightning strikes amongst the countries in the world! But how come? Is it because there is a lot of rain here? Malaysia highest really?? Okay, that I didn't know... Prolly due to the many open spaces there? No. 7 & 8 are interesting. Never heard of them before. Nice work! I never knew a mobile phone was safe. Actually I never knew most of these. Very interesting! i'm just too afraid of the big flashes of lightning. Foong, sorry you couldn't gain access to my blog. I get this too once in a while lately and it's worrisome. But it's okay now. Pls try again. Tekkaus was able to access it a while ago. I probably need a new blog. Thanks for the shoutout. My area has a lot of lightning activity, possibly due to the type of soil which attracts more lightning? Anyway, better be safe and unplug your modem or electrical equipment when the storm is very intense. I had my then brand-new DVD player kaputz after it got struck by lightning..
You can buy umbrellas that are made of bamboo and oil paper, remember those old fashion umbrellas? They don't attract lighting. The other alternative is buy umbrellas made out of carbon fibre (the same type of material as fishing rods). They do not conduct electricity and are very popular with golfers. lina, thanks for the scary post! I enjoyed reading it. Sorry you have to go through restless night to write the post. Lucky you didn't write it in your house. Haha! SK, we should think about that right? What a waste of resources. Haha! keeyit haha! Yeah, very funny. I laughed every time the scene showing the old man talked about being struck by lightning. 7 times still survive! He must be the most unlucky or is it lucky man in the world? LOL! pikey, me too! We are quite similar I think. I like karaoke and malay songs and rain and thunderstorms and so do you. Hehe! cashmere, actually Malaysia not highest, but only one of the highest. I think Singapore also have their fair share of lightnings, no? heidi, well now you know! Haha! adui.. why so dangerous wan? n i tot umbrellas are safe! even the well-equipt water heater is not safe? sigh.. i was not really scared of lightning n thunder b4.. but now i AM! thanx to YOU! hahahaha..
Hi Foong!!! When u gonna have a new post? I wan to chop!! !